Cost: Varies, depending on materials selected. Approximately $15-25 as shown. Organic designs are in! Make something fun for summer with this great shell bead pendant! 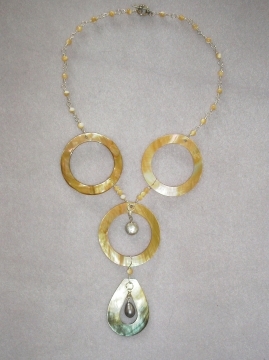 This necklace features big bold shell donut beads, with a teardrop shell and pearls dancing inside, with mother of pearl round beads in a chain. An eye-catching design that is lightweight and so fun to wear! 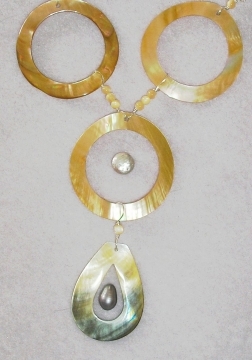 3 large Shell Donut beads, and 1 Teardrop Shell Bead. Shell Donut Beads for sale on eBay. Clasp of choice. I used a sterling silver toggle clasp. We will use some sterling silver wire to create the pendant drop detail. Cut five lengths of silver wire, several inches long. 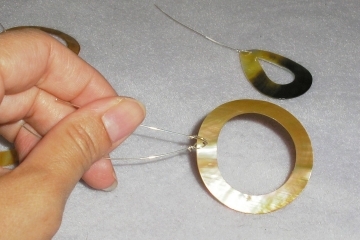 Attach the wire to the hole in the shell bead with a large diameter round loop. If you need help learning to make a loop, follow these instructions. On the center round donut shell, you will attach two wires, so one can attach to either of the top two donut shell beads. Using a closed wire wrap loop to make connected beaded chain, (see instructions), connect the shell components. Let's start on the bottom. Slide one bead on the wire, and then made a very large diameter loop (so that it fits onto the bottom of the shell donut), and close the wire loop. Next we will attach the center bottom donut shell to the top two shell donuts. Slide three mother of pearl beads onto each wire, and again make a very large diameter loop to attach each wire to each shell donut (so it fits and hangs easily on each shell), and close the wire loop. Next we will attach the pearl beads so they hang inside the two bottom shells. Cut two pieces of link chain of the proper length so each bead will hang in the center of the shell donut. I used a coin pearl in the center shell, and a teardrop shaped pearl in the bottom. Slide each pearl onto a headpin, and make a wire loop on the top of each pearl bead, using your round nose pliers. 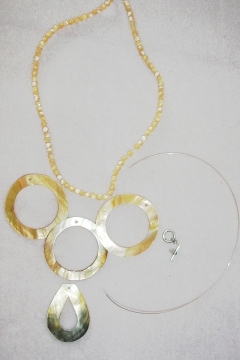 Attach each pearl to a piece of link chain with a closed wire loop. You will have two pieces of chain with a pearl at the bottom of each one. Next, let's attach the chain and pearl components to the shells. Open a jump ring, and attach the chain and pearl component to the wire loop at the top of each shell bead, then close the jump ring carefully with your pliers. Follow these instructions to become familiar with this technique. The chains should be hanging with pearls dangling in the center "frame" of each shell. If your beads are hanging too low and the chain is too long, just remove it from the jump ring, cut off a link or two, and put it back on. 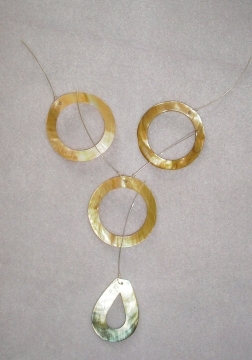 Now we will begin making the mother of pearl beaded chain that goes around the top of the necklace. With each mother of pearl bead, slide it onto a short length of silver wire, and make closed loops, attaching each bead following my instructions for making beaded chain. 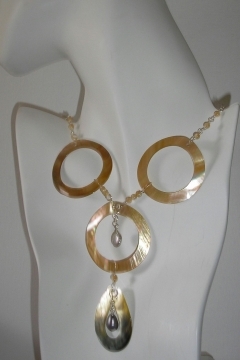 Use a bead design board or ruler to determine the proper length of your necklace. When the necklace is the length you want it to be, attach the clasp components to the ends and close the loops. That's it, your new pendant is ready to wear!